These images are selected from photographs made in the Argyll region of Scotland on visits at the end of May. 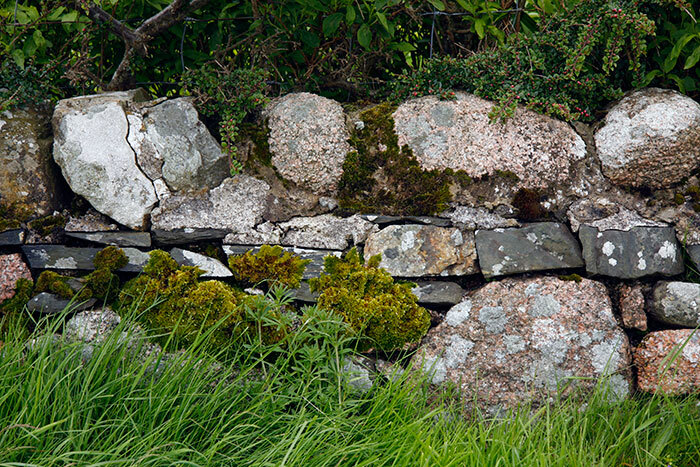 One interest is in the many variations of stone type and form, and the construction methods, used in building the walls enclosing fields and gardens. Their gradual structural deterioration and changing interaction with vegetation add to their visual quality. Set off the west coast of Kintyre, the small island of Gigha has a mild climate. 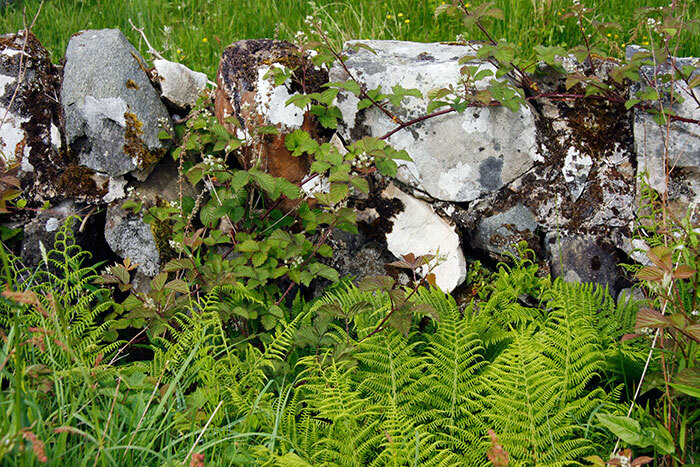 This sturdy wall carries rich lichen colours and textures backing delicate new growth ferns. The narrow island is some seven miles long and separated from the mainland by a twenty minute ferry crossing. It's unusual in that the island is owned by the Islanders following a community buyout from the last individual owner in 2002 and the formation of the Gigha Heritage Trust. 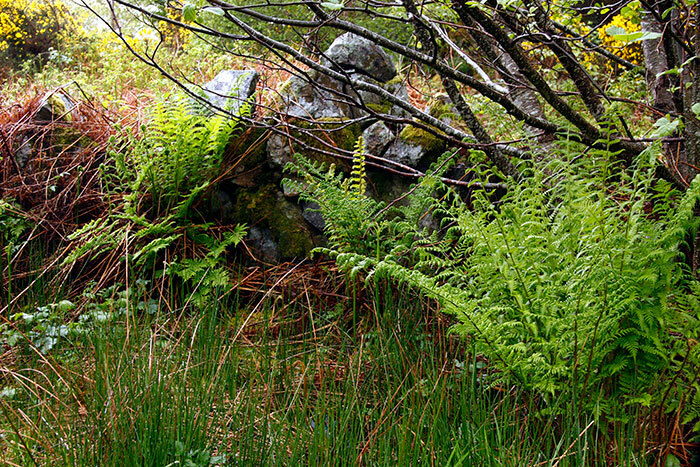 This image records one of a few small gaps in a long wall clear of the dense growth of all manner of flora. A robust replacement Parish Church was completed in 1923. The grey and brown whinstone walls are sparingly pierced by narrow round-topped windows containing some striking stained glass. The ruins of the 13th Century Kilchattan Church stand on high ground nearby to the south-west. It's surrounded by old and contemporary graveyards with many fine memorials from the distant past. Lichen enriches many of the headstones carrying family details cut in beautiful letter forms. 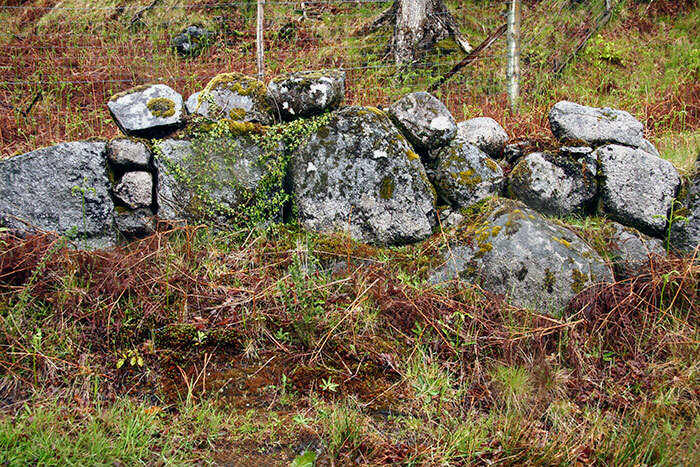 This wall bordered the road uphill to that Church. The extensive woodland and formal gardens of the nineteenth century Achamore House are adjacent to Kilchattan Church. The House is still privately owned but the gardens are managed by the HeritageTrust. Imposing stands of Gunnera grow in the woodland that's also home to the many rhododendron varieties collected by Sir James Horlick, a past owner. 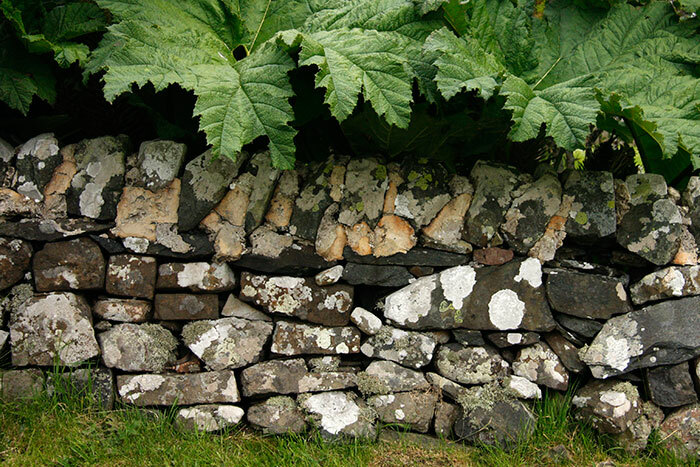 This wall and Gunnera leaves stand by the road through Ardminish village close to the ferry pier. 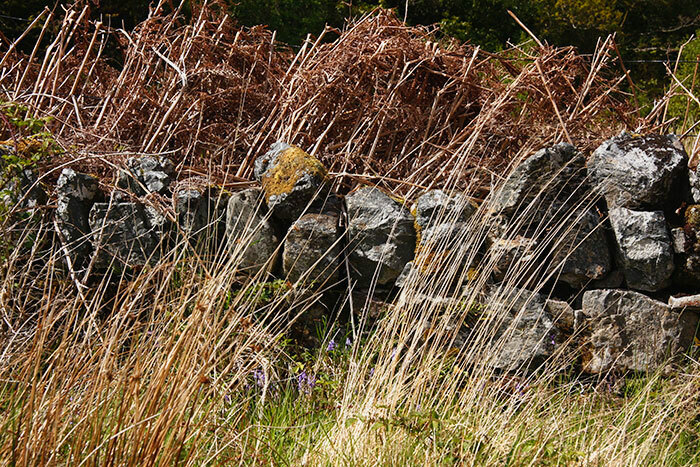 Spring growth was not so far forward in Appin when I made these images. 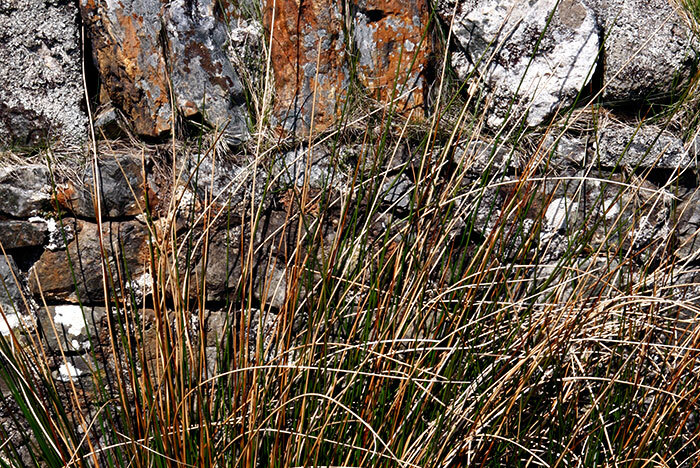 Autumn bracken and grass bracket the wall lacking coping stones. Appin is an area to the north of Oban surrounding the road to Fort William. Woodland and coastal walks can be followed and a small passenger ferry crosses to the Isle of Lismore from Port Appin. I liked the contrast between the rectangular stones and the linear curves of the narrow leaves, as well as their colour connections. 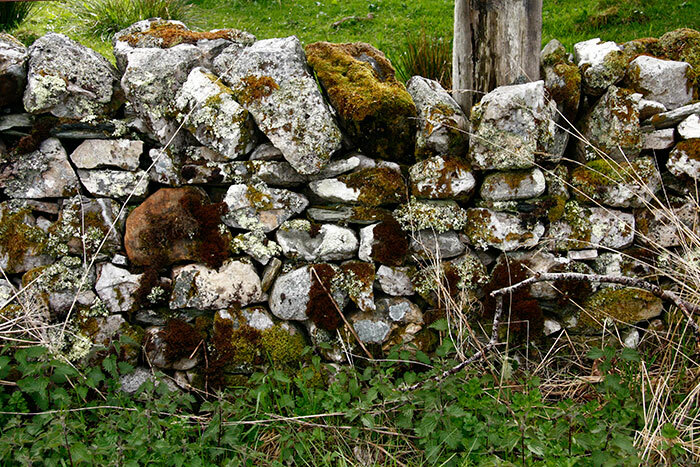 Sheep grazed in the field beyond this tightly packed small-stone wall. The new season's stinging nettles will soon obscure some of the rich moss and lichen. 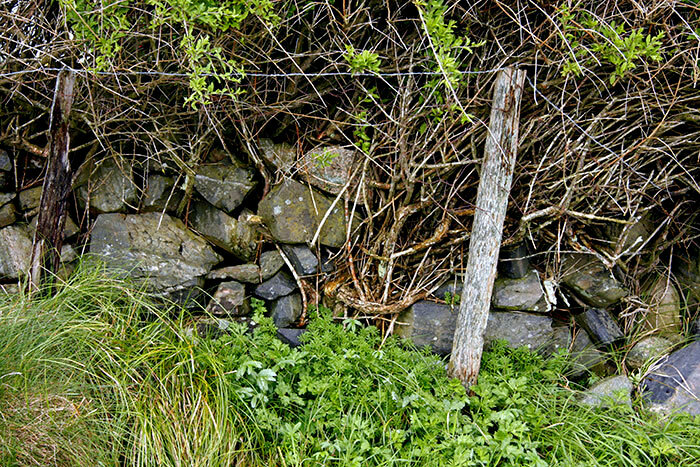 Substantial wooden posts were built into the wall at intervals along its length. They're railway sleepers presumably once used to carry the rails on the nearby Ballachulish Branch of the Callander & Oban Railway. Opened from their station at Connel in 1903, it closed in 1966. The track bed with relics of its associated structures and architecture can still be seen close to the coast highway. 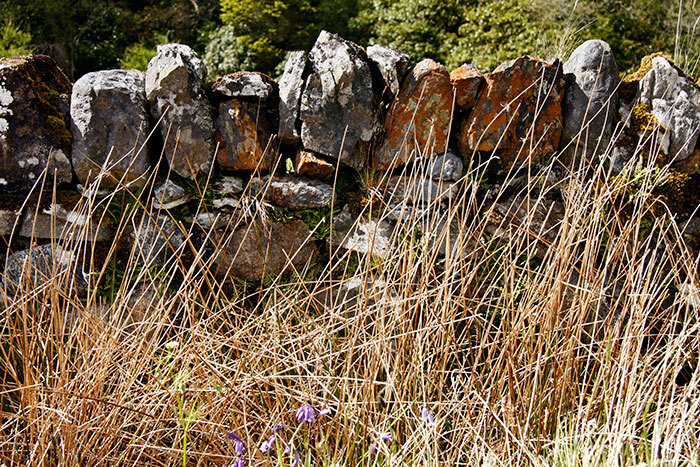 Dried gasses and fading bluebells stand against a section of another field wall. 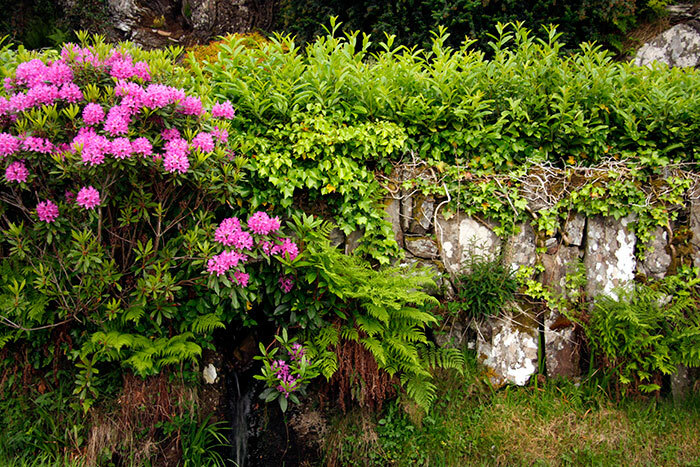 This substantial wall edged a garden in Tarbert from which a small stream emerged to flow its final yards into the sea. 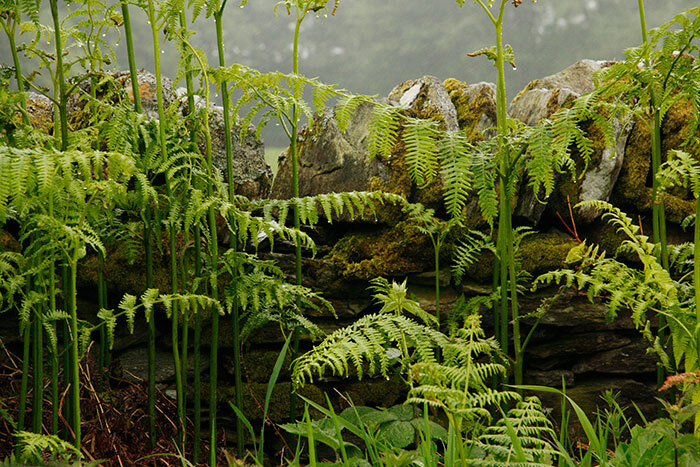 These bracken fronds were growing vigorously against a moss clad wall near the small village of Skipness. The early morning rain cleared to bright cloud cover on our coastal walk. Remnants of what must have been a substantial wall on the edge of old open woodland were backed by square mesh wire fencing. 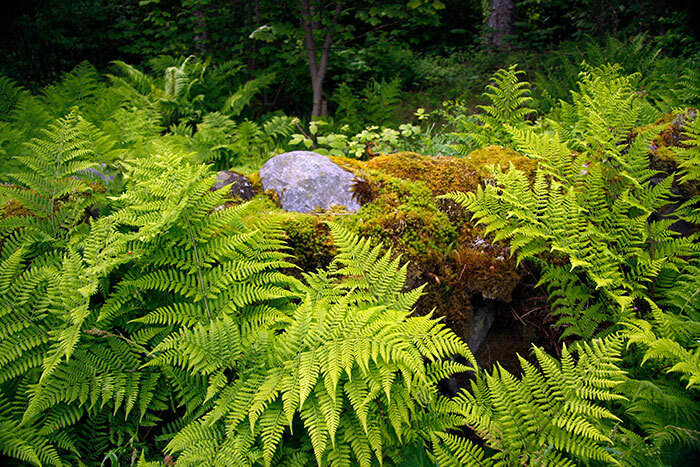 New bright green bracken fronds were beginning to emerge from the browns of old growth. 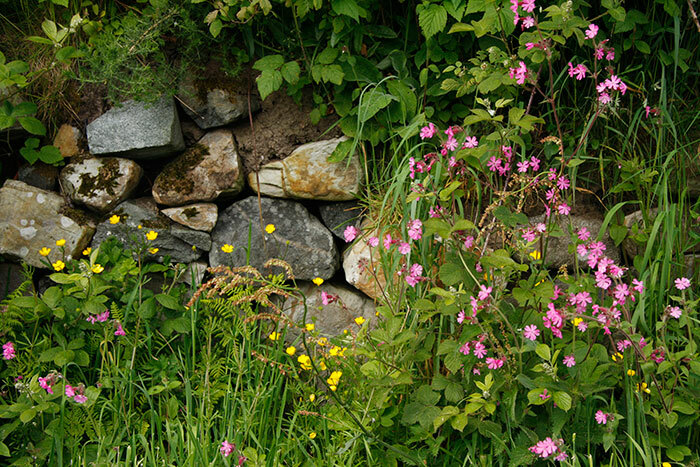 Light rain falls on a tumbledown wall and fresh greenery set close to the water's edge. Easdale Island was extensively quarried for slate over some two hundred years from the mid- eighteenth century. 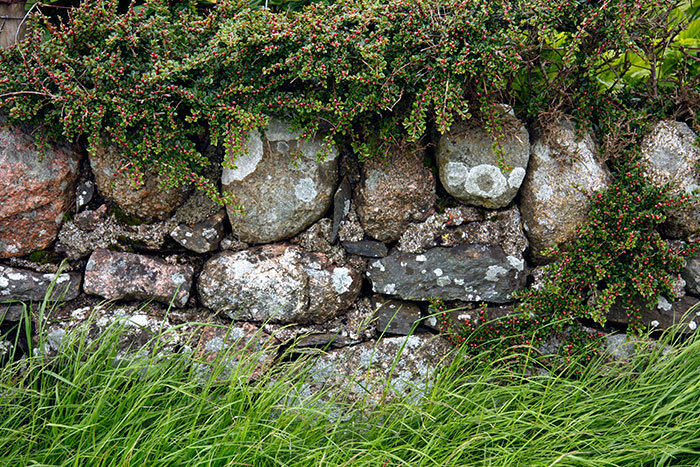 Its stone was also used in building island houses and working buildings as well as the many walls around the Island. The last are remarkable for the variety of styles adopted in arranging the un-mortared stones from the monumental harbour pier to modest structures enclosing allotments for vegetable growing. Here, the edge- stacked stones reflect the angled stratum in the rock face beyond. 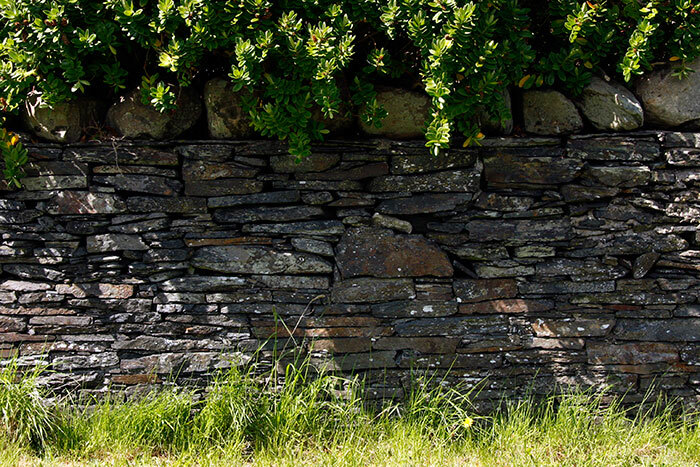 Built from more carefully cut and conventionally laid stone, this wall borders a garden in the Island's village. 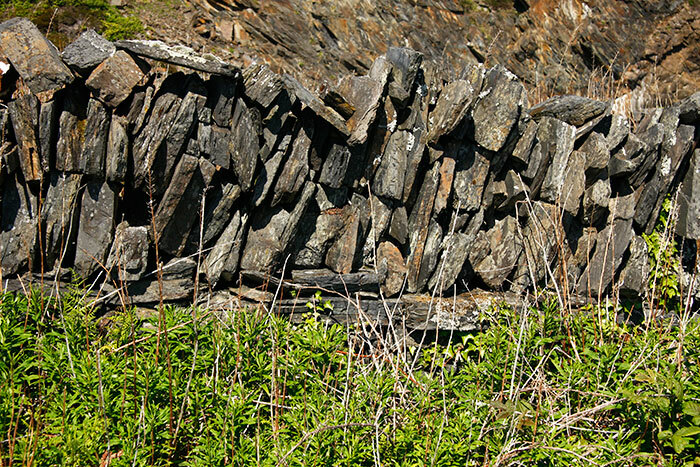 The EASDALE STONE gallery contains a collection of images related to the Island's slate mining past. It seems that overcast skies, rain and sunshine all featured on my most recent visits to west Argyll. The ferry from Oban to Craignure sailed under grey but dry skies. The bus to Fionnphort and the Isle of Iona passed through heavy showers and the final stretch by boat was across rough dark waters. Thoughts of working bathed in the Island's magical sunlight were confounded. This and the final three images were made on the early part of a walk across the machair to the west coast beaches. Catoneaster and grass sandwich a second sandwich of large found and smaller quarried stones. 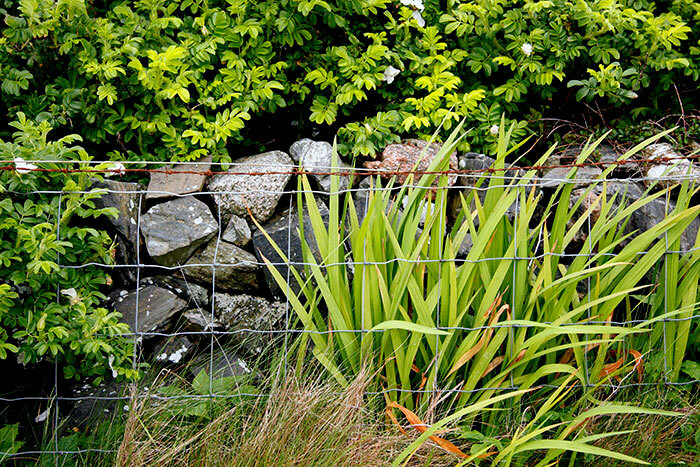 A less substantial and more elderly wall is helped by wooden posts and hedging which has grown around and through it for a long time. The IONA STONE gallery concentrates on native rock on the northern beaches, buildings and unadorned field walls. A variation on Image 16, and all the other walls! I find landscape photography more taxing than the other ‘man-made' themes I explore, perhaps through comparison with photographers whose work I greatly admire and the doubt as to what I achieve. The approach adopted here and in images such as those in Yosemite Fragments 1 & 2 is intended to counter such thoughts. I spent time on the west and north coast of Iona and may include some of those black and white images in a future landscape gallery.